During our December Kids Craft Program, we create these cute, fast, and fun Gable boxes. 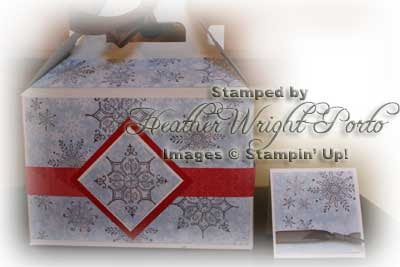 The Christmas Cocoa designer series paper was used, with Baroque Motifs (stamped in Chocoate Chip Craft Ink), Chocolate Chip Wide Satin Ribbon from the Clearance Rack, and Whisper White paper. The pointsetta and gable boxes were purchased from an online store since I needed a large quantity and didn't want the kids to have to "cut out" anything. However, instead of using the poinsetta, many of them stamped a tree, snowman, or Santa. Others used the Felt Snowflakes from the Clearance Rack with rhinestones as well. 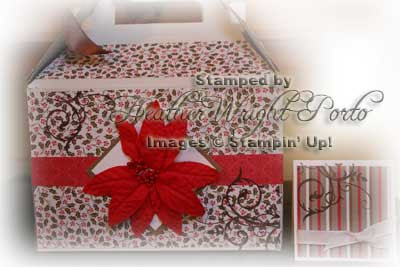 This is another sample that Michaela gave to one of her teachers which features the Frosty Day designer series paper and Chocolate Chip Wide Satin Ribbon from the Clearance Rack, the Serene Snowflake stamp set from the Holiday Mini (stamped in Chocolate Chip Craft Ink), and Real Red and Whisper White paper.